Designed for RIDGID® Model 12-R die heads. Other RIDGID die heads (OO-R, OO-RB, 11-R) can be used using adapters. It can also be used with 258/258XL pipe cutters. Capacity 1/8" - 2" Pipe (6 - 50 mm). 1/4 "- 1" (8 - 25 mm) Bolt (using 00-RB Die Heads). Weight 25 lbs. (11 kg) Power Drive only. Length 28 1/4" (71.7 cm). Gear Head Spur gear reduction face gear drive. Spring-loaded adapter pawls. Hardened steel spindle gear. Die Heads 12-R. Other Die Heads with adaptors: 00-R, 00-RB, 11-R.
Model 700 Power Drive is rated 4.9 out of 5 by 24. Rated 5 out of 5 by Remodeler from meets expectatons Having used a hand threader for many years I was anxious to try this tool. I was amazed at how easy and effortless is was to use. Took very little time to get used to. Highly recommend. Rated 5 out of 5 by Nicolas from Super fast Coming from a ridgid manual pipe threader to this, is like day and night. The amount of time and effort needed for the manual threader is unbelievable. Threading 1-1/2 galvanized pipe could take me at least 30min (I'm not a plumber). Using the 700 power drive to thread the same pipe, took only 5 min the first time I used it (setup to finish). The machine is heavy and it takes time to get used to it. I work for a nursing home facility and we only thread 1-1/2 pipes for sink drains, and I his is a life and time saver. Rated 5 out of 5 by gilmanm from lifetime tool if you abuse this 700 power drive daily for 10 years, maybe you'll have to throw a few parts at it, but in all other cases it will last a lifetime!! Rated 5 out of 5 by Flatop from Great HD tool I've been using Ridgid industrial tools for decades. They are the best in this category. Buy one and you won't be disappointed. Rated 4 out of 5 by Davey from just like the older ones This power driver is just like the ones made years ago with the very durable and robust casing. Nothing wimpy about this machine. I s a 14 gauge/12 amp extension cord powerful enough for this ridgid machine??? Are there attachments to be able to groove pipe? do not know for sure but i believe there is. what does cmpl and hs mean on the die head types? Thanks for contacting RIDGID! The HS stands for high speed for the dies. CMPLT is mentioned in our catalogs because its the diehead complete (including the diehead and dies already set into it) rather than just the diehead and having to purchase dies separately. If you have any other questions please let me know, we can be reached at 888-743-4333. How do I find hp or watt rating of an existing Model 700 unit? I would like to purchase an additional unit of the same specification. Thanks for writing! The unit pictured is a 115V Model 700 Power Drive, available from your local RIDGID Distributor. 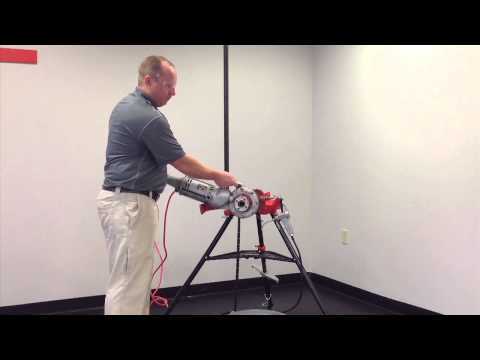 Full specifications on the product are available on our website at https://www.ridgid.com/us/en/700-power-drive. To locate your nearest distributor, please visit https://www.ridgid.com/us/en/where-to-buy.